I felt like an idiot coming as late as I did to knowledge of Barrington Stoke, but I know now and I'm here to spread the word. I went to a seminar given by the publisher Barrington Stoke at the Children's Books Ireland conference a few years ago. They talked about children with dyslexia, reluctant readers, and other people who had trouble with reading books. Their novels are shorter than usual novels, they use a dyslexia-friendly font, and many young people report that they hadn't read a novel until they found their first Barrington Stoke. One of the things I love best about their novels is that the stories are aimed at a particular age (eg 'teen') but the reading level is set below the average complexity of that age. Anyone who has taught children or adults who have trouble with literacy will know how difficult it is to find novels which aren't patronising for their age, and no teenager wants to sit and read the books they had in Primary school beside their peers who are reading the latest YA. Barrington Stoke choose only the best writers for their books (life goals: I'd love to be one of them some day) so you're getting top quality fiction which can be read by young people who might be reading their first book or just developing a love of fiction, but also won't bore readers who have a reading age on or above the average. The last Barrington Stoke novel I read was Keren David's The Disconnect, aimed at teen readers whose reading level is the average for someone aged 8. It's coming out in April and it's brilliant. It's the story of a group of young people who are challenged by a mysterious business person to give up their phones for six weeks. There is a cash prize if they can manage it and Esther needs that money so she can visit her dad, sister and new baby nephew in New York. The challenge soon puts a strain on friendships, however, and Esther has to weigh up whether or not the sacrifice is worth it. 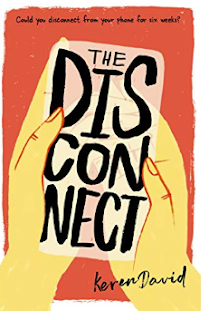 One of the things I enjoy most in good novels is a strong sense of place and I loved this in The Disconnect. It's set in London but it is strongly the London of Esther and so it feels local and cosy in a way that I could never experience the city as an outsider. Esther's mum and her partner run a cafe called Basabousa with Middle Eastern/British fusion food which sounds so wonderful that I'm hoping it's based on a real place. But the story is just great in general. It's full of friendship dilemmas, thoughts about identity and fitting-in, and a realistic look at youth culture's reliance on social media. It made me wish I could go back in time to the days when I was classroom teaching. I'd bring a class set and we'd all read it. It's that kind of book- I can't imagine a young person not enjoying it, whatever their reading age. Many congratulations to Keren! Look out for The Disconnect when it lands in the middle of April, and check out the other Barrington Stoke titles too. If you have a favourite Barrington Stoke novel please leave a comment- I'd love to hear about them. That's a wonderful review - Keren's book sounds great. Barrington Stoke does great work.